I was out and about and saw something that was of interest, a motorcycle with a tire on the sissy bar tied down with a Motorcycle Cargo Net. The load was secure and balanced. So I started to imagine the rest o the picture. Was he going to help a friend or just going to get a tire changed. Why the tire on the bike? Did he have a car or was that his only means of transportation. Either way what good idea. This time of year people think of traveling. No matter which means you use the biggest worry is what to pack. The same is true for motorcycles. 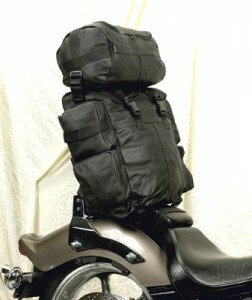 So having the right Motorcycle Luggage on hand makes things so much easier. Whether you want to take an extended stay on your trip or just for a day or two, having things with you gives you more time to do what you want to do, relax. With all the stress of the season, isn’t it great to have one less thing to think about. Merry Christmas to all. Today I was on the road traveling and early on there really wasn’t a lot of traffic . A few cars and I did see a scooter. The scooter saddlebags were full and I could see a little wrapping paper. When I saw him I thought what a great way to go to a friends house to deliver christmas presents. The weather wasn’t too cold and the sun was out. Here was one of santa’s helpers doing what he enjoyed. What a great day. Got a few days off. The weather is nice. What to do. Time to go riding. Get out the large sissy bar bag. What to pack. Jacket for cold weather, long sleeve shirt, rain gear, change of clothes. Lets get out the sleeping bag and tent just in case we find a nice place to camp out instead of staying in a hotel. Everything is on the bike safe and secure. Lets go. Riding is a great way to clear your mind relax and just feel like it is you and nature. Have you ever needed space for keys or glasses or your cell phone. Most times when you go riding they get buried in the bottom of a bag and then you might not even be able to find them when you need them. I have seen Motorcycle windshield bags on bikes and it seems like the perfect place to put any small item that you need to get your hands on. Riding the entire day with sun shining is great. Then comes darkness. Time to change glasses. Stop take a break and reach in there they are. I would carry a bag of nuts or any small snack just so I would have it when I got hungry or an extra bandana if the bugs got too bad.